By Thérèse Angelo, Director, Air Force Museum of New Zealand. A year on from February 22nd and working in Christchurch still feels slightly surreal. There is much that is business as usual and much that isn’t. We seem to have created our own new sort of normality living in damaged houses, managing without many of the usual urban amenities and choices, and coping with congested and damaged streets. But it now serves as our routine. With significant aftershocks in June and December, and every day still more buildings being condemned, we continue to live with uncertainty and the knowledge that more large quakes could occur at any time. Most important for us at the Air Force Museum, our people are fine. Some are still living in homes badly impacted from the September quakes, and at the other end of the spectrum some have now had their homes repaired. All of us to some degree are suffering from a kind of mental and physical fatigue; the cumulative effect of more than a year of broken sleep. Some have the additional impact of quake stress and anxiety – their own or their family’s – to deal with. But generally, we are coping well, supporting each other, and looking forward with some optimism. Our facilities have not come through completely unscathed but luckily our land is very stable and building damage has been relatively minor. However, it takes time and resources to fix broken ceilings and windows, replace light fittings, check hanging wires, and to get structural surveys done to allow us to open again. Two heavy snow-falls have also brought challenges. After a year of supporting other institutions and helping salvage collections we still have artefacts, art, and archives from at least 14 organisations on site squeezed into our stores, archives or hangars. For some collections there is no choice but to be housed in containers out on the tarmac. The Museum’s theatre is still in use by the Family Court; we still host an IRD team in our classroom, and in November we were even a polling place due to a shortage of suitable venues. Visitor numbers are good but income is mostly tourist driven and that is down quite a bit. Still, we are holding our own and remain relatively well off compared to so many others. The Museum team has been amazing in giving up their own work spaces to others in greater need and compromising storage areas to take in displaced collections. We have learned a great deal indeed about pragmatism and how far compromise can go before there is any real threat to what we do. The most significant and positive outcome from the last 12 months is that we clearly see how museums can be a real community asset and in ways no one would have thought of before the quakes. Perhaps now museum disaster plans should look outwards at what the community might need as well as inwards to what the museum will need. While so much infrastructure is being demolished in Christchurch, we are reversing the trend. In November 2011, the Museum started construction of a large extension to the existing facilities. The plans for the extension had been underway since 2004 and while a good percentage of funds had already been raised the recession had slowed progress. However, the potential rebuild following the earthquakes and consequent demand for contractors with forecast significant price increases forced us to make a decision on the future of the project; build now or shelve it. We decided to take the risk and start building. That in itself is not straightforward in Christchurch. While the plans had been finalised in 2009 and documentation for a building consent completed ready to lodge when funds came to hand, everything had changed in a quake-ravaged city. New seismic codes were being introduced and no structural engineers would risk re-designing a building until they knew exactly what was going to be prescribed. As virtually everyone probably knows getting insurance has been exceptionally difficult and when after several months brokers were able to find someone willing to insure for contract works, it was at twice the price expected and something in the order of quadruple the price pre-quake. Anticipating valuable major re-build contracts, some contractors were not willing to provide fixed price contracts, which had the potential to increase the risk of price escalation. 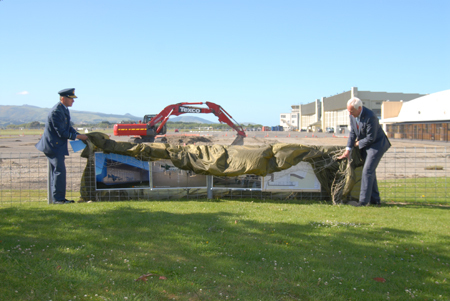 But all of that has been worked through and in November the first heavy machinery rolled onto the site to start preparing the foundations. Of course there is the small matter of raising the rest of the funds. This huge, 6,200 square metre, $14.3 million extension is designed to display aircraft currently in storage and to provide proper workshop space for large object conservation and restoration projects. In turn, this will free up existing space to be retrofitted as stores to enable us to bring in some of our technology and vehicle collections from a dilapidated off-site building. But despite our need, we won’t be doing that just yet. What we will be doing is making this new space available to other heritage and cultural organisations for three years. We are collaborating with a range of agencies to create a Canterbury Cultural Collections Recovery Centre (CCCRC) where collections can be stored and accessed. Many of the smaller museums, archives and heritage groups have lost their premises and have no resources to fund storage. Even when they can find storage, they can’t access their collections, records and files. Some don’t yet even know what has in fact been salvaged. The CCCRC will provide a venue where they can bring their collections and people together with space and facilities for cataloguing and documentation, cleaning, conservation, boxing and display preparation. There will be no charge to use the space. We hope that we can attract grants and sponsorship to assist with the necessities such as IT, tables, shelving, boxes and archival materials, cleaning and conservation products. We also hope that those in the wider museum community that offered help in those initial few weeks, will still be willing to come and assist those that need specialist advice. We look forward to talking to anyone that is going to need the CCCRC and to anyone that wants to help. After the year that has been, it feels really good to be actively working towards a positive and collaborative future project. We know just how lucky we are to be in that position. 1. 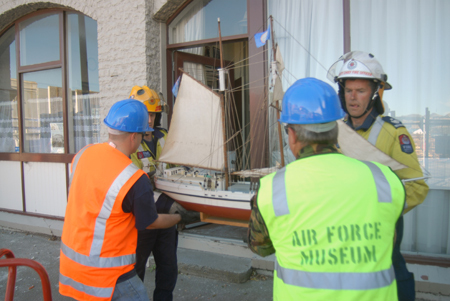 First salvage sortie from Lyttelton Museum, March 2011. Photo courtesy of Air Force Museum of New Zealand. 2. The Mayor and Chief of Air Force launching the new building plans, November 2011. Photo courtesy of Air Force Museum of New Zealand. 3. 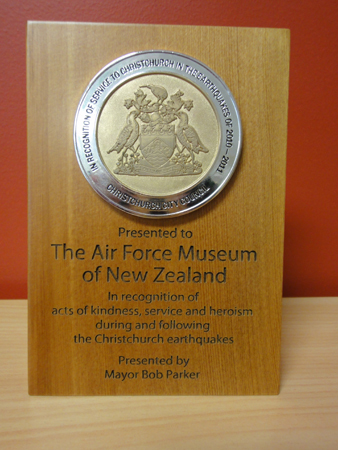 Earthquake Award for Service, presented 22 February 2012. Phot courtesy of Air Force Museum of New Zealand. Thank you for your article. It has given me a lot to think about in relation to our collection and being of service to our community in the event of a disaster.